At 106 minutes (including the credits) Quantum of Solace is the shortest Bond film of all-time. I initially was afraid that this short running time really meant that this Bond was just rushed into production and thrown together. It’s clear now that the short running time is due to its modest reach and its economical approach to telling its own story. Almost as a counterpoint to how The Dark Knight deepened and expanded Batman Begins, Quantum of Solace seems satisfied wrapping up Casino’s loose ends. The result is a satisfying and solid companion film to Casino Royale. Quantum of Solace immediately jumps you into the action and it rarely does let up throughout the entire film. I won’t really give you a synopsis of the plot (as there really isn’t much to speak of) except that it requires Bond to briskly move from location to location, giving the film an energetic pace that is maintained until the final credits. It was said of Casino Royale and it cannot be mistaken here, the Bond that is portrayed in Quantum of Solace owes much of its pacing, editing, and action sequences to The Bourne Supremacy and The Bourne Ultimatum. Not only do the action sequences continue in the close-up, quick-cut tradition of the films, but a couple of the sequences actually reminded me of similar sequences in the Bourne films themselves, especially the Tangiers sequence from Ultimatum that is broken into three different sequences in Quantum. Now the fact that the film is influenced by Bourne, doesn’t mean that its bad or boring, the opposite is actually true. The action sequences are well-shot and give the film a visceral and brutal aesthetic. There is a lot of close up shots and what others call shaky cam, but I have to say that the sequences were still clear and coherent to me. Like their Bourne counterparts, Quantum’s action sequences offer just the right ration of wide and establishing shots to give the scene some gravity and clarity, but just enough close-ups to provide the immediacy that it wants. I can’t tell you how much I prefer these sequences to any number of sequences in the later Brosnan Bond films. Although I stated that the film’s reach was modest, I wouldn’t say that it was a bad thing. I honestly feel like each film in this re-booted Bond series is singularly focused on introducing and giving James a particular character trait we’ve always assigned to his character. Casino Royale introduced us to the Bond that has learned to “Love Em’ and Leave Em’”. After Vesper’s betrayal in Casino we understand how Bond has learned to treat women so callously. In Quantum we wonder if Bond will be a man led by duty to his country or by personal vengeance. By the end of the film we actually witness Bond earn his “its only business” demeanor. I am quite thoroughly enjoying this stripped down approach to slowly building the Bond character that we all know and come to love. There are certainly faults to Quantum of Solace. The film seems to meander at times and for a film with such a short running time, actually feature quite a bit of filler and repetitiveness. Our main villain, while much less cliché, is also a bit flat. There is a danger to providing a subtle, he’s just like everyone else villain. The danger is that the audience will sigh and be convinced that he’s just like everyone else! Unfortunately that’s exactly what does happen. Our new Bond girl suffers a little of the same fate, and actually suffers under the shadow cast by Vesper from Casino as well. Quantum of Solace is not the action epic that Casino Royale was, but it’s a worthy sequel. It’s a fun ride thats over pretty quickly. The extremely high production values, craftsmanship (Forster does a great job of directing), coupled with its modest reach make for a good times out at the movies, just not a very memorable night at the movies. Would it be fair to liken QoS to Matrix: Reloaded in that the sequel picks up where the last left off and doesn't let off the accelerator? I haven't seen it yet (box office still costs too much), but I've seen very tepid reviews...that is, if a review can be 'very mediocre'. Kyle, I am actually going to disagree with your review. I thought Quantum of Solace was an incomplete film, left way too many loose ends, and was far too dependent on action. I'm not sure I can express my problems with the film as eloquently as your very well written review, but here are some of my thoughts. So, I'm a fan of the Bond franchise, from Dr. No to Casino Royale, and I realize that "action" is the name of the game. But Casino Royale was so very different from the tried and true formula that I had very high expectations for Quantum of Solace. Casino seemed to be equal parts action and character driving the story, with a nice emphasis on Bond's ability to feel--whether in killing or in loving... The (perceived) betrayal by Vesper was emotionally huge in Casino, and I really enjoyed this carry over to Quantum. What I didn't enjoy was that there were so many unnecessary chase scenes. There was a foot chase, a boat chase, a car chase, even a plane chase! Each of these had the same predictable outcome--Bond takes some damage, gives some damage back, Bond ultimately escapes/conquers... While the polish on each of these scenes was nice, but taken together the chase sequences just didn't add enough to the story. Of the loose ends I mentioned, the major ones are: How did Bond find out who the Algerian guy was (Vesper's boyfriend), and where to find him? What is "Quantum" and are we supposed to be entirely dependent on the next Daniel Craig Bond movie to address this organization? What happened with the CIA and British ties to Greene Planet? Who was the guy (Mr. White?) from the end of Casino Royale, why did he not appear in a larger role in Quantum of Solace? Kyle I know you don't give the "B" rating lightly, but I thought Quantum was closer to just an average--maybe a "C". So on the whole I would recommend viewing Quantum of Solace for the "true believers" (who have recently watched Casino Royale); for anyone else I would say "pass"--save your money for Valkyrie. I agree with Micah in that the chase scenes seemed a bit "put in" for the sake of having them. It's as if there's a checklist for the different "mediums" of chase scene. They left out one though, the outer space chase scene, which was a precedent established by the oh-so-underrated "Moonraker", one of my favorite Pre-Craig James Bond movies. 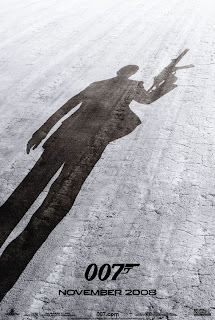 Overall, I enjoyed the film, but what the heck does "Quantum of Solace" mean? I mean, I get that Quantum is some sort of organization, but what is the solace about? It sounds poetic, but doesn't make much sense, quite like most worship songs...interesting. Bravo to Pierce for managing to take a shot at worship songs in commenting on a James Bond film. You, sir, are my hero for the day. I definately understand with what you are saying and agree with it as well. The film picks up where the plot ends with Casino Royale, but it really follows the plot though action ideas that movies like Bourne Supremacy and Ultimatum endorsed. Ultimately I think both styles are valid, but still need to be done well both ways. I agree that QoS had several superflous action scenes. I prefer three or four set pieces of action with a longer running time to 6 or 7 shorter action sequences. Cutting a few more and adding some length to the ones left I think would add a lot to the film. However, I have to be honest, the action that was one the screen was engaging and interesting, and just as good if not better than any of its counterparts this year. It just wasn't all that memorable (due to the quantity and length). I just watched From Russia With Love, and there is an excellent train fist fight between Connery and the Baddie (Robert Shaw). Its a fight that would stand up to anything today, and it stands out in the film because it isn't one of 6 fist fights. As far as the inconsistencies, I guess all I can say is that they really never bothered me that much. I liked the introduction of the Quantum group and I guess I just assumed that it would be revealed in later films. I too had a few questions about details (which the brisk pace didn't help), like how did Bond know where Vesper's boyfriend was. I think that when Greene told Bond, "I answered every thing you wanted to know", that he asked him where Vesper's "boyfriend" was. I've got a post coming soon that explains my grading system in depth a little more, but a "B" for me translates roughly into "I liked it and only had a couple reservations about it". I honestly enjoyed what QoS was, and walked out with few reservations. Its not a terribly memorable film, but what is on screen I enjoyed quite a bit. The term "quantum of solace" means "a small measure of comfort amid sorrow or disappointment". The film never uses the term during the film (do people really like that? ), but I think it actually has interesting things to say about what happens in the film. Unfortunately, the film doesn't make a lot of attempts to draw this out, much of it has to be put in by the viewer...which is also a feature of many of today's worship songs.